(Source: New Energy Times) The is a list of the major recognized theories in the field of LENR research that have been consistently presented in the related LENR conferences or published in mainstream peer-reviewed journals. Steven B. Krivit developed this list primarily from two sources. The first was the result of a broad survey he performed for his and Jan Marwan's peer-reviewed paper "A New Look at Low-Energy Nuclear Reaction Research," Journal of Environmental Monitoring, published on Sept. 3, 2010 (DOI:10.1039/B915458M). The second source was from Thomas Dolan's slide presentation to the New Energy Institute board of directors on May 21, 2009. 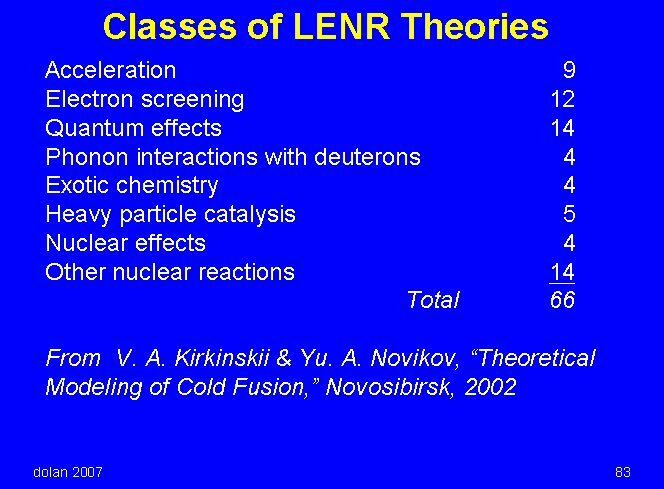 There are an abundance of theories that purport to explain "cold fusion" or LENR and Kirkinshii and Novikov identified a total of 66 LENR theories in 2002 (see summary slide by Dolan below). For each theory, Krivit created a separate Web page with an identical set of fields to help readers make comparisons between theories. Some of the data in the fields come from the Krivit/Marwan paper. Krivit queried (where possible) the authors of each of the theories and requested them to contribute additional information for their respective pages. Specifically, Krivit asked each person, or their representative, if the theory resolved Huizenga's three miracles. All LENR theories, at a minimum, must explain Huizenga's three miracles. Any theory that claims that "fusion" takes place in LENRs must resolve Huizenga's "miracles" to be minimally scientifically sound. Thus far, no "fusion" theory has done so. Only the neutron-based theories have resolved some of the three miracles and only one (Widom-Larsen) has resolved all three. Source © New Energy Times. Use with clearly identified source attribution permitted. Thank you for your integrity.